In 2018, Canada will issue a new $10 banknote bearing the likeness of Viola Desmond, a businesswoman and black civil-rights activist. Joining her on the shortlist was Elsie MacGill(ElecE 2T7), Canada’s first female electrical engineering graduate, and the world’s first woman aircraft designer. This fall, hundreds of aspiring female engineers chose to follow in MacGill’s footsteps by joining U of T Engineering. The proportion of women in its first-year class is now 40.1 per cent, the highest figure among Ontario engineering programs. This brings the overall proportion of women across all undergraduate programs over 30 per cent. The achievement is just one reflection of the Faculty of Applied Science & Engineering’s broad commitment to enriching diversity — in all its forms — within the engineering profession. Driving that diversification in U of T Engineering are events such as the Girls Leadership Experience in Engineering (GLEE) and the Young Women in Engineering Symposium (YWIES), which inspire girls as they learn more about the impact they can make as engineers, in fields from sustainable energy to health care. Each year the Faculty engages more than 7,000 elementary and secondary school students, about half of whom are girls, with innovative outreach programming on our campus. 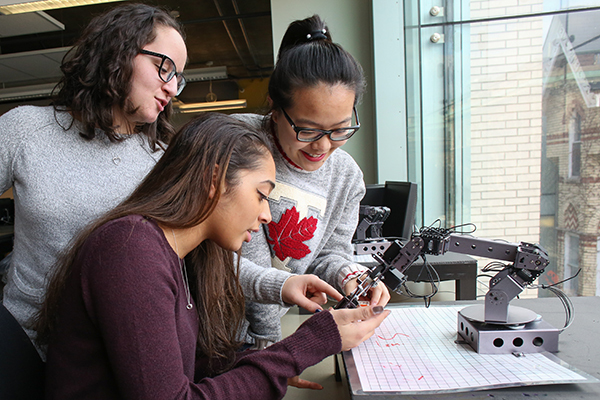 U of T Engineering undergraduate students, including members of the Engineering Society’s Hi-Skule outreach group and Women in Science and Engineering (WISE), also visit schools throughout the province. These STEM ambassadors lead students in immersive workshops on engineering topics, acting as mentors and sharing the boundless possibilities of an engineering education with children of all backgrounds. Fourteen new professors — including nine women — recently joined the faculty, bringing with them experience from some of the world’s top research laboratories, such as Cambridge, Carnegie Mellon and MIT. Many hold academic appointments in more than one department, and will work on a range of cross-disciplinary challenges, from smart cities and infrastructure to next-generation devices for medical diagnostics and imaging. The Faculty is promoting diversity on a number of other fronts. Strategic recruitment and outreach initiatives in key areas of the world have doubled the number of international applications for undergraduate programs since 2010. Currently, 27.9 per cent of undergraduate students hail from outside of Canada, up from 9.8 per cent in 2006–2007. Last February, the Faculty created a new position: Director, Engineering Pathways and Indigenous Partnerships. The Director will coordinate a Faculty-led outreach program to First Nations, Métis and Inuit communities, with the goal of increasing the rate of participation of Indigenous students in Engineering. These efforts align with calls by the Truth and Reconciliation Commission of Canada to reduce educational gaps between Indigenous and non-Indigenous Canadians.